Seasons Greetings from all of us at Real Vision TV. As another year comes to an end, we’ve prepared a specially curated selection of what we think are some of our best videos from 2016, to keep you going over the festive period. 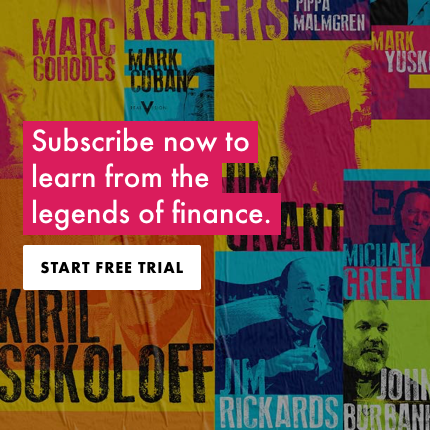 Enjoy repeat performances from some of the investing greats that graced the Real Vision screen this year, including Jim Rogers, Kyle Bass, Jeff Gundlach and more. Scroll down for the full selection. To kick things off, Edward Misrahi, Goldman Sachs alum and founder of Eton Park, takes us on a grand tour of the word’s emerging markets, highlighting the potential risks and best opportunities to profit. We won’t be putting out any new videos until 2 January - as Milton needs some time off too - when we’ll be back with more great content. Until then, we’ll see you on the beach! Pakistan stock market has delivered more than 50% in 2016 and there was no coverage at all in this interview. Im a venezuelan shipbroker, based in Venezuela, and i cant agree more with this guy.. Lots of investor running out of their venezuelan positions now and some clever guys are buying cheap. Cool guy, with a great outlook on things. Thanks RV….. and Merry Christmas. Great interview. Funnily enough his best short idea is one anyone retail investor can do. Put options on Deutsche stock are a no-brainer... to quote Alex Gurevich, "they're incredibly, unbelievably, egregiously cheap"
The points about that Kenyan bank and liquidity rallies in Frontier Markets was an interesting point. SHORT Turkey BIST 30 on a 6 month view was the other key take away for me. Exactly the kind of content I wanted to see subscribing to RV. Engaging, erudite, and thoroughly enjoyable. Great work, gents. Out of the money puts. Love it. Check out Fairfax India as an interesting India bet. Brilliant perspective, delivered in humble style! Great guy, tremendous knowledge, eloquent thinker and talker. Great Turkey call! God, both Raoul and Edward are literally brilliant, and I f'ing love RealVision TV. I don't watch any regular TV at all. Only RealVision TV and Internet news sources. What does that say about my personality? Real Vision is all about pros and cons and listening to all points of view......so....I like the wallpaper. :>) :>) tres chic .... enough said. Finally, someone talks about Turkey. Fantastic interview. Full of ideas. Well done Real Vision/Raoul. A real pleasure to listen in on this conversatio. Eton Park has gone down in recent years, perhaps because he left? Thanks Raoul for introducing him to us! That India stock is HDFC Bank! His country calls are pretty accurate I think - long Brazil, India but short South Africa! Brilliant trip around the world. What strikes me is that after all of it, European bank exposures remain a distinctly unstable finger of instability. I wonder, if/when DB goes under, how or if the contagion can be contained and whether nearly everything can be bought significanlty lower? Would appreciate any thoughts on that. Extremely insightful, with clear and thought provoking views. Fantastic. Loved Edward's deep understanding of so many countries and his way of simplifying and getting to the crux of the issue. Thank you. The one take away was pricing for liquidity. Have to plan your escape (and how difficult that is) prior to your buy. This is also a lesson in EM and in DM, when the trade is headed away from consensus direction. Excellent thought provoking piece! great work! Incredible breadth. Just when I thought Raoul had wrung him dry....he blasts off on South Africa. A nice tutorial on portfolio Liquidity management in here as well. Top notch interview with Raoul at his best in HIS wheelhouse. Wow, interesting guy. Tour de force of fascinating content about EM investing, including what he focuses on. Also good to see Raoul open up about global macro. Fair amount of confusion on the Modi government. It has utterly failed to rein in Hindu militants, including on the diplomatic front. Sure, buy the index, but you don't give Modi much credit when it goes up. Wow - fascinating interview! Very enjoyable to watch AND very informative. This is why I subscribe to RV - thanks guys! One word to describe this interview: Brilliant. Fantastic overview of EM.